This widget may be really helpful to increase your blog's pageviews. Moreover the button has 3D effect which you can see by clicking the button in the below demo. For adding this search bar to your blog just click the below button. After clicking the button you will be redirected to Blogger.com and your widget would be added. If you think that you need to make some changes in the code or the above button is not working for you then you may use this method. After adding the code save the widget and finally save the template. You are done now. 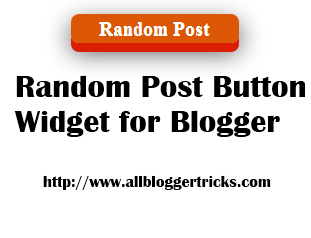 Now you and your visitors can see and use this Random Post Button Widget for Blogger. Can you please tell how to load different post on page reload instead of clicking the button. Thank you for Random Post Widget Post. I need this and I have added in my blog to view rand post.